Please include attribution to http://bazomo.com/ with this graphic. 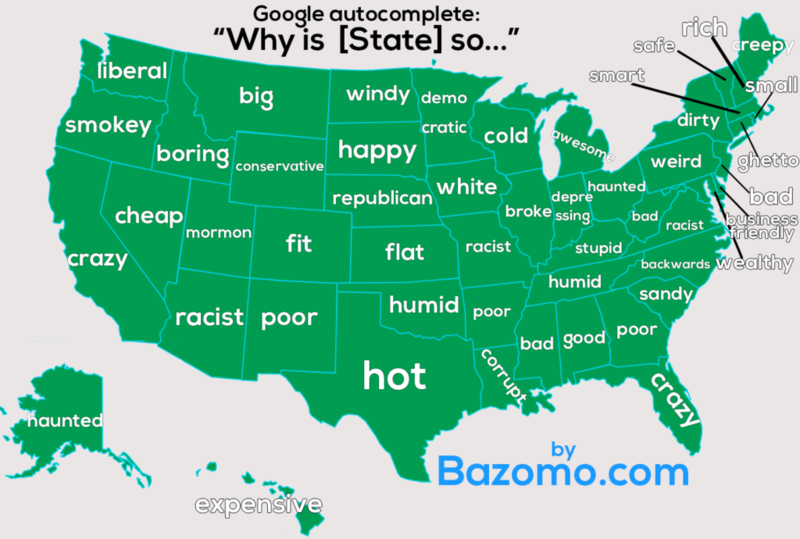 Have you ever wondered what people ask Google about your state? Maybe this is the answer of what impressions people might have of each state. Well, at bazomo we did just that and went over to Google.com search field and typed in “Why is (State) so…” and noted down all the autocomplete suggestions. Then mapped out each word to the corresponding state! Below is mega list of more queries for each state, some of the more recurring ones are ‘hot’, ‘boring’ and ‘poor’ it seems.